Welcome to Lips Week on Beauty High! For an entire week, we’ll be serving up content about all things lips. From lipstick tricks and interviews with experts to lip color guides and more, enjoy everything Lips Week has to offer! If there’s one beauty product that can instantly make our day better, it’s lipstick. From bold reds to sassy nudes, putting on a gorgeous lip color can really make your look pop (in the best way possible). With the good comes the bad, however, and with lipstick that can mean anything from broken bullets or melted formulas to stains on shirts or long-wear colors that won’t come off. 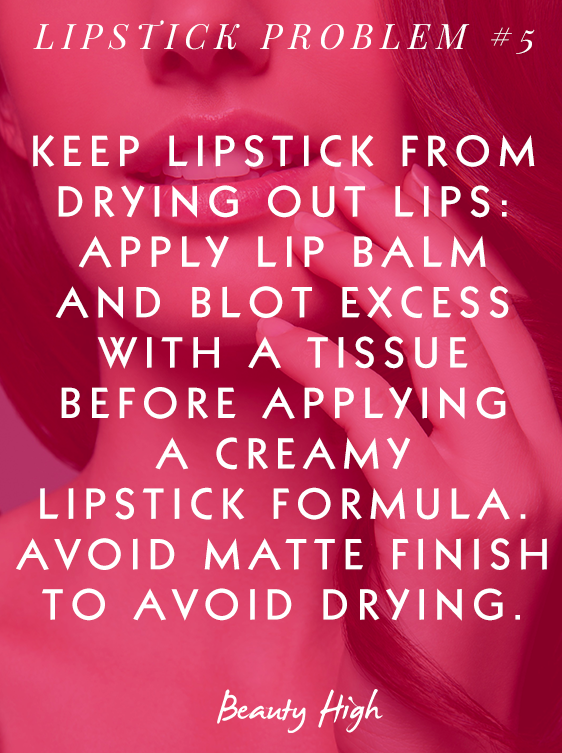 To solve your #LipstickProblems, we’ve pulled together the solutions for all of them below. Problem #1: Your lipstick broke. 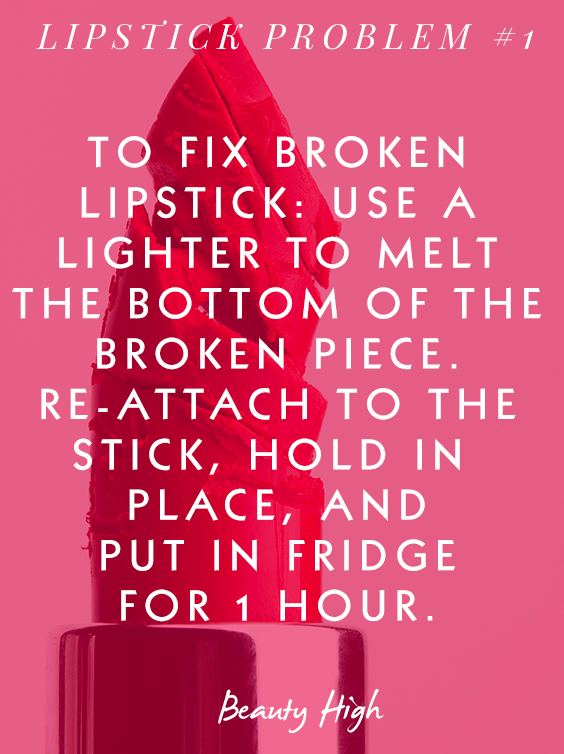 Take the broken piece of lipstick from the tube and use a lighter to melt the bottom of it just a little bit. Then, place it on top of the intact lipstick in the tube, pressing the two parts together. Hold it in place for a few seconds to fuse the two pieces together, then clean up any rough edges by smoothing things out with the flat part of a toothpick. Place the lipstick in the fridge and let it cool for about an hour, and it’ll be good as new! 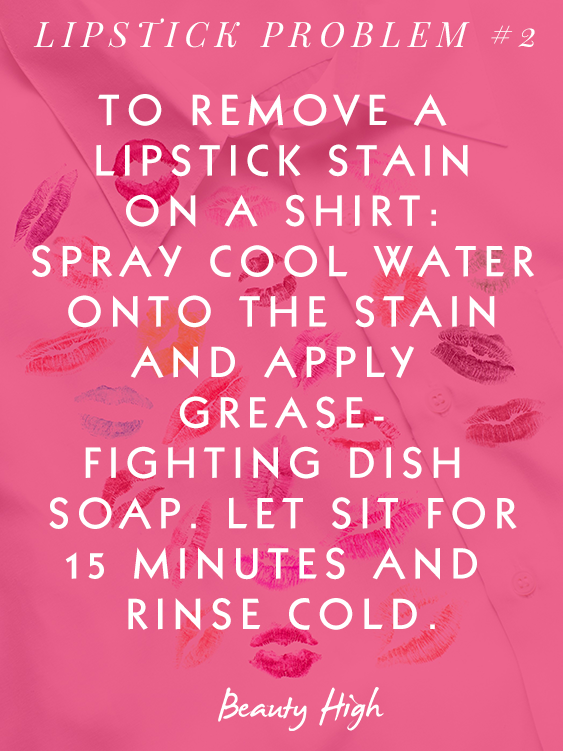 Problem #2: You got lipstick on your shirt. Begin by spritzing your shirt with a bit of cool water just over the stain. Take a grease-fighting dish soap, like Dawn, and squeeze a few drops over the stain. With your finger, gently rub the soap in concentric circles over the stain then let the soap sit for about 15 minutes. Then, rinse with cold water, and launder as usual. Problem #3: Your lipstick melted. 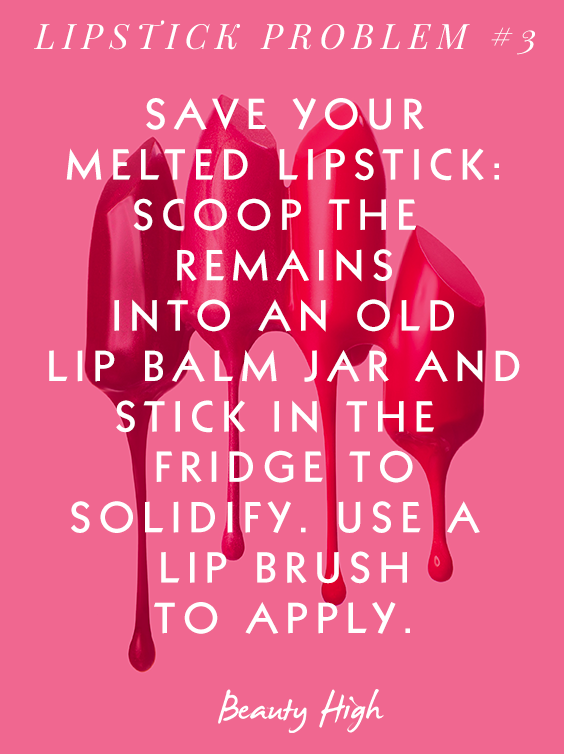 To save a melted lipstick, get an old lip balm jar or tin. Scoop the melted lipstick into the tin as best you can, and flatten out the top with a knife. If need be, put the tin in the fridge to solidify the cream a bit. Use a lip brush to apply the lipstick. Problem #4: You always get lipstick on your teeth. 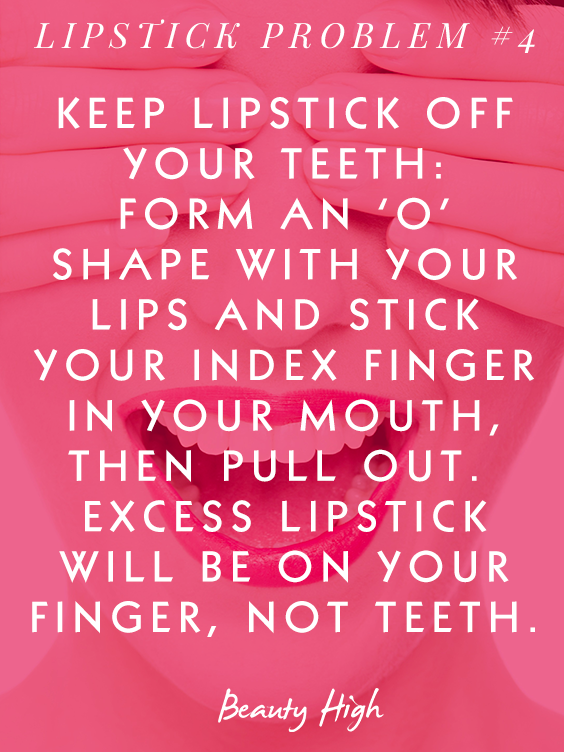 After you apply your lipstick, form an ‘O’ shape with your lips and stick your index finger directly in your mouth. Pull your finger out, and you’ll see a ring of lipstick from the inside of your lips. This is the lipstick that would’ve gotten on your teeth, but this way, you’re removing it before it becomes a problem! Problem #5: Lipstick always dries out your lips. First, try to choose creamy formulas instead of matte finishes. Before you apply lipstick, apply a bit of lip balm. Gently, take a tissue and blot away any excess balm. Too much lip balm can stop the lipstick from being able to hug your lips, but just a bit will keep your lips hydrated underneath. Apply your lipstick as you normally would. 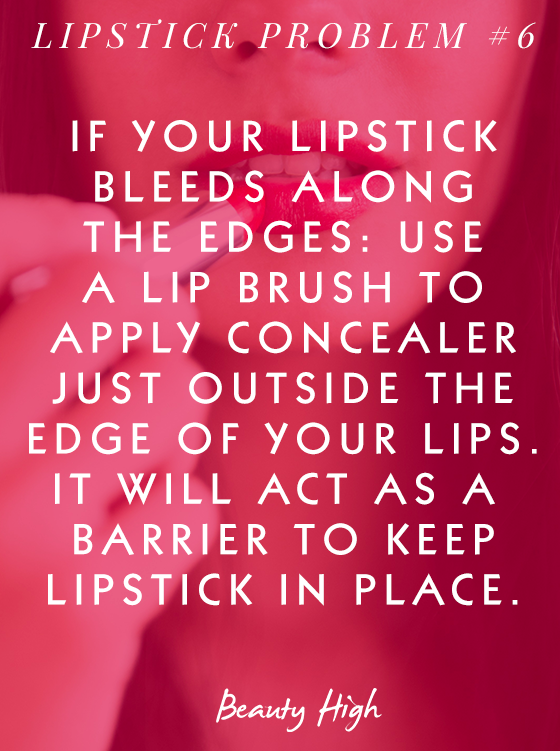 Problem #6: Lipstick always bleeds at the edges of your lips. Using a lip brush, apply a thin line of concealer along the edges of your lips, then blend a bit so it’s not noticeable. Then, apply your lipstick as you usually would. The concealer will act as a barrier between your lips and the edges, keeping the color from bleeding. Problem #7: Your long-wear lipstick won’t come off at night. First, loosen things up a bit by applying a thick layer of petroleum jelly all over your lips, then let it sit for about 15 minutes. 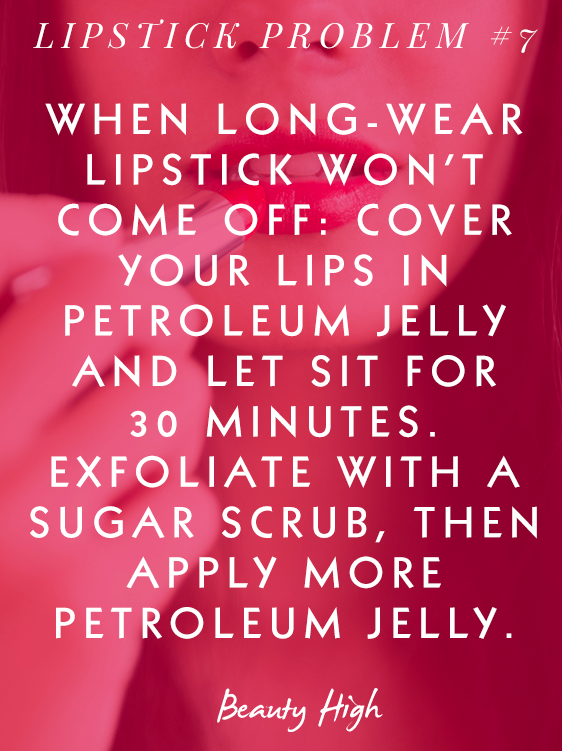 Next, exfoliate your lips with a sugar lip scrub, and wipe clean with a towel. To rehydrate your lips after the day, apply another thin layer of petroleum jelly. 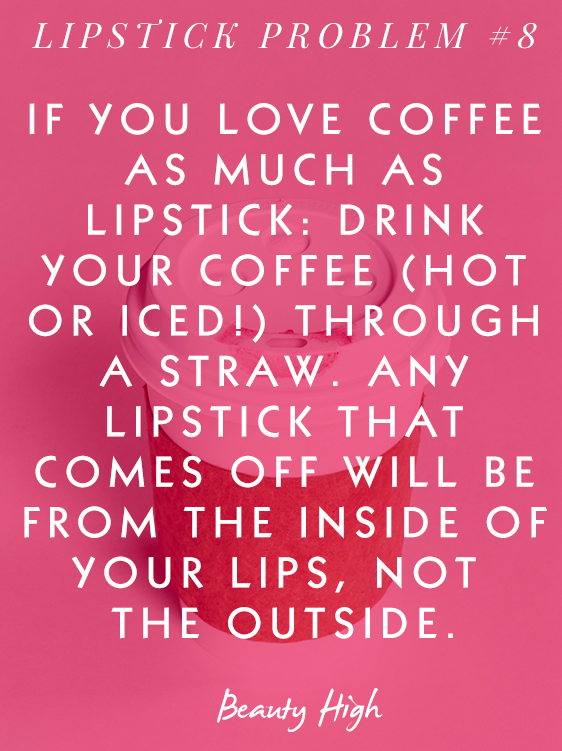 Problem #8: Drinking coffee takes off your lipstick. Whether it’s coffee, tea, or hot chocolate, if you’re drinking a hot beverage out of a to go cup, use a straw while you’re wearing lipstick. That way, any color that comes off will be from the inside of your lips, not the outside (which is where the color comes off when you’re pressing your lips directly against the lid).